Submitted by ken on January 21, 2007 - 5:18pm. 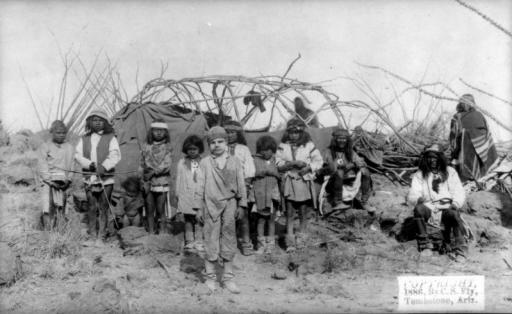 The captive white boy, Santiago McKinn, poses with a group of children in Geronimo's Camp. Behind him is a partially constructed tent. The photo by Camillus Sidney Fly was taken in 1886 shortly before Geronimo's surrender to General George Crook on March 27, 1886. McKinn was taken from his home near Mimbres in the New Mexico Territory in 1885 by Chiricahua Apaches. McKinn assimilated with the Apaches during his captivity -- even learning their language -- and cried when he was returned to his family.